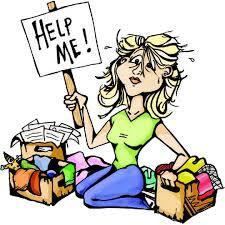 More Than A Mom: Spring Clean 2015 - Overwhelmed Much? Spring Clean 2015 - Overwhelmed Much? I am following the FlyLady system and attacking one "zone" per week, getting as much done in that zone as I can and then moving on. There are only 6 zones so it goes (far too) quickly before I'm back again. I recently read a book about the Konnari method of cleaning based on Marie Kondo's book, "The Life Changing Magic of Tidying Up: The Japanese Art of Decluttering and Organizing". She has a very specific order of "tidying" as she calls it (though it seems pretty much like taking a power washer and leaf blower to your house and pushing all things out the door!). I'm blending a bit of both methods in that I'm focusing on one zone per week and majorly purging in that zone as much as I can get to. So far a lot has left the house so I'm feeling good about that. Getting everything in "like with like" piles though is causing for some flare ups in other areas, mainly the basement and my creative space. This is causing a wee bit of an internal freak out but I'm pushing on. The good news is that the areas I have done are getting a daily sweep through to keep tidy. This week's zone is The Kitchen (which I am utterly dreading). Today I'm doing laundry so I'm tidying a wee bit in the laundry room (not this week or last week's zone!) so I can get into that room. So far I'm sorting and storing winter coats. For a family of 4 we have a lot! I keep meaning to downsize but there is always a use for extra coats with young children around! I'll use the Konmari folding method (into thirds and vertical). The winter hats, mitts and scarves have been washed and are in a laundry basket awaiting my next burst of energy to sort and purge through them. Does it ever end? Good thing is that it is sort of relevant because last week included the front closet which I didn't get to. It all seems to overlap.